Unlike Axl Rose, California funk vets the Red Hot Chili Peppers enthusiastically accepted their recent induction into the Rock and Roll Hall of Fame. Not only did the band perform at the ceremony this past Saturday (April 14) in Cleveland, they're getting ready to put out a covers EP featuring songs by prior Hall of Fame inductees. Entitled We Salute You, it will be out digitally on May 1 via Warner Bros.
Three of the tracks were recorded in the studio and three of them are live, and they include songs by David Bowie, Neil Young, the Beach Boys, Ramones, Iggy and the Stooges, and Dion and the Belmonts. The bulk of the covers aren't exclusive to this collection, as they've popped up on B-sides and compilations over the years. Some of them date back to past incarnations of the band (the Stooges cover emerged in the early '90s) and are currently unavailable digitally, although the cover of Neil Young's "Everybody Knows This Is Nowhere" comes from the band's current I'm with You tour. 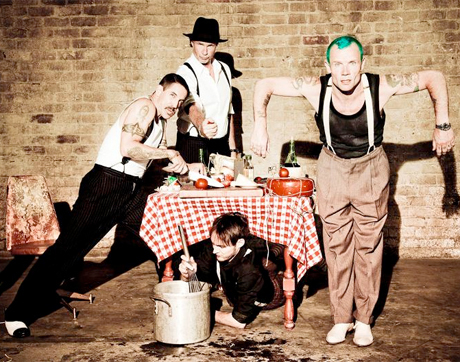 The Chili Peppers also recently released a digital EP of live cuts from their 2011 tour.